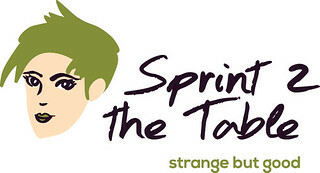 I am really glad to be back participating in Strange But Good, hosted by Laura at Sprint 2 The Table. I’ve missed several weeks to do being away with computer problems and then being sick when I got home. I’m back and I’m on the mend, so I’m pretty excited to be here. Be sure to stop by at Laura’s blog to check out the strange things going on there! As I said, I’ve been sick so there wasn’t a great deal of cooking going on here. However, I was blessed with left overs from our St. Patrick’s Day dinner at sister Ele’s house on Saturday, so that helped add to the strangeness. I actually have 2 meals to offer you. The only thing I did get around to doing was making a crock pot full of black beans so they helped out. Ok, this looks and probably sounds pretty strange. In the center is some of Ele’s best ever mac n’ cheese. She really does make the best. 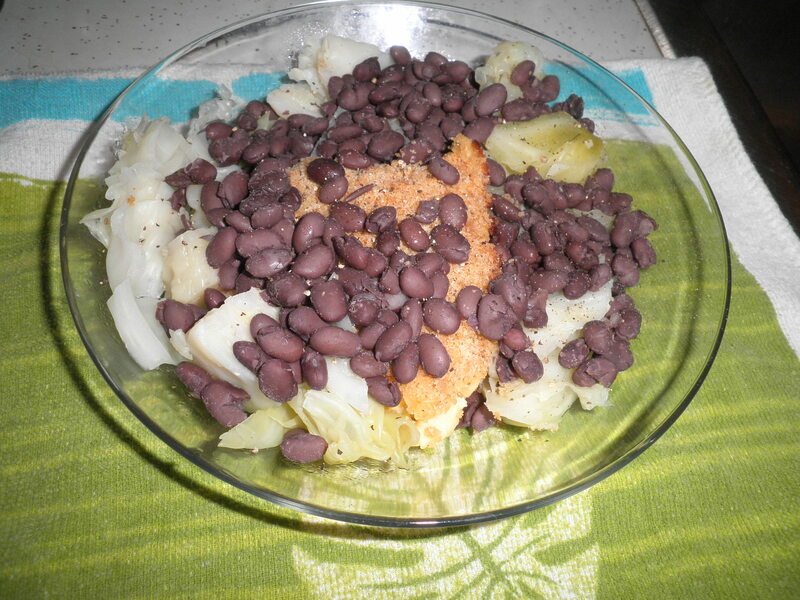 It’s surrounded by leftover cabbage (yum) and topped with black beans. Of course, I ate around and on top all to leave the mac n’ cheese for last. This was tasty and filling. This was leftover salad from Saturday as well as the last of the cabbage (yum.) I added a cup of black beans and cut up some Weight Watchers cheese sticks. 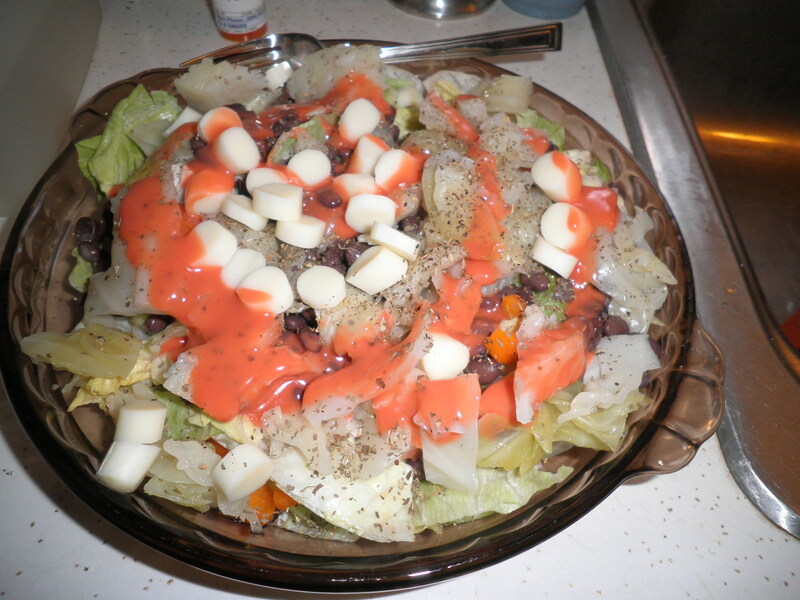 Topped with Catalina dressing. That really is the last of the bottled dressing I have in the house. Now I’ll be forced to make my own, which is what I’m hoping to do. I think I’ve outdone myself with strangeness this week. Hope you will all stop by at Sprint 2 the Table and check out more strangeness and leaves some comments. Happy Friday…Hope yours is Strange But Good! This entry was posted in Uncategorized and tagged beans, crock pot, Strange But Good, Weight Watchers. Bookmark the permalink. happy friday, fran! we got more snow (although just a little) over night – winter sure is hanging on! catalina -> always a favourite here, too. my brother and i used to just call it “red” and i still really enjoy it! good for you for making your own! glad you had some enjoyable eats this week despite being under the weather! Hi Cathy! We’ve had snow flurries several times this week, but fortunately none of it stuck. I love catalina…I need to find a recipe to make my own. Feeling much better today. This may be over soon! That’s too funny, Liz! But you’re safe there, marshmallows are one of the few things I don’t like. Only way I like them is toasted over a campfire. Anything else…yuck! Have a great day, Dear! This is awesome! I still love that you eat your creations out of a pie dish. Best idea ever. Thanks, Laura! I’m feeling loads better. Still have a lingering cough, but I have faith it’ll be gone by next week. The pie dish works so well…things can’t escape so easily. I’m glad to be back too! I love there’s mac n cheese buried underneath your beans and cabbage. It’s like buried treasure. Glad to hear you are on the mend. Hi Meghan! I did that on purpose…wanted to save the best for last. Feeling so much better, I think I did too much yesterday and I’m a little wimpy today. I’ll get better as the day goes on though, I think.